The most important thing one need know about ATI Creative Consulting (formerly ATI Graphics, Inc.) and CEO, Larry Bloom, is that our success is deeply rooted in the successes we have made for our clients. While web searches and traditional advertising direct business to our virtual doors, it is a steady stream of word-of-mouth referrals that make up the bulk of ATI’s business. Knowing this, we treat every project with each new client as the beginning of a long-term relationship that will bring not only repeat business from the initial client, but also new business brought in by that satisfied customer. This philosophy is reflected in the many testimonials and recommendations from past and current clients. Clients of ATI Creative Consulting (formerly ATI Graphics, Inc.) receive more than premier design, development and consulting services. Company President Larry Bloom is an active, quality networker and assertive connector of people. ATI Creative Consulting clients have the advantage of becoming part of that trusted network and the ability to add many valuable connections. Larry Bloom also served as the host and facilitator of the well-regarded Breakfast of Champions Networking group in Chicago’s north shore suburbs, from 2010 until discontinuing the monthly meetings at the end of 2016. In the media, Networking has been lauded as a top mode of building one’s business, especially in the recent economy and the added value of this resource can not be overstated. ATI Creative Consulting’s vast network of professional relationships has been the center of its growth. Clients of ATI Creative Consulting are welcomed into that network, creating a valuable return on the investment of working with ATI Creative Consulting. Early in 1997, at the suggestion of his employer, Kodak Processing Labs (KPL), Larry Bloom established ATI Graphics, Inc. (now ATI Creative Consulting) to provide outlab graphic services to KPL commercial photo labs throughout the country. It soon became apparent that there was great potential in the new business, and with that in mind, along with an entrepreneurial spirit, just enough cash in the bank to get through the start-up period, and a copy of the entire client database he had built while with KPL, Larry Bloom began working full-time as the sole proprietor of ATI Graphics, Inc.
Mr. Bloom had cultivated countless professional relationships by that point in his career, primarily due to his focus on customer service, and several of his past clients quickly became ATI Graphics, Inc. customers. “During those first couple of years, I would randomly bump into an old customer on the train or at the bank, we’d talk for a few minutes, I’d give them my card and within a couple of days, we’d be working together again,” explains Bloom. At first, Mr. Bloom continued to provide professional photo finishing services along with digital photo retouching, graphic design services and specialty items such as photo business cards. In 1999, a customer requested that ATI Graphics develop its website. That first website project led to a steady stream of word-of-mouth referrals, and soon enough, ATI Graphics had found a niche as the web developer for many high-end photo studios and other businesses in the events industry. While niches are comfortable, they can be a little too comfortable, and after 2001, when economic confidence really took a hit, it became clear that in order to stay in business, the client-base would have to include a variety of customers and industries. “It was definitely a ‘sh%t or get off the pot’ moment,” Larry says. “In 2002, I increased my business line of credit and traded in both of my cars for a single car and a quick influx of cash to help me through 2003, which was a tough year. In the fall of ’03, I even had a job offer to consider, but I took a gamble on ATI Graphics, Inc. and turned it down,” he adds. The gamble paid off, in January of 2004, just 3 months after declining the job offer, ATI had it’s best single month since its inception. Since then, business has steadily increased and Bloom was able to reinvest in the company, upgrading hardware and software, hiring programmers and designers, and seeking and winning bigger, more complex projects. The business that started in 1997 creating graphic film overlays for Kodak and doing small photo retouching projects is today a thriving, full service branding, graphic design, web development and consulting company. In January of 2018, Bloom rebranded ATI Graphics, Inc. as ATI Creative Consulting, to more accurately represent the services provided by the firm. In a crowded field of branding and web consultants that have materialized to capitalize on an expanding industry, Larry Bloom stands apart. With 17 years of web development and over 20 years of design and branding under his belt, Bloom eclipses many of today’s “experts” by offering a modern eye for strategy and a “pre-web” sensibility about business and marketing. Bloom educates clients on effective messaging and the difference between a web site and a web presence, and he promises a solid ROI for every client dollar spent with his company, ATI Creative Consulting (formerly ATI Graphics, Inc.) Bloom’s On-Demand Advisor Program offers even more value to clients. At a young age, Bloom knew he would be an entrepreneur. Many of the adults in his life — neighbors, relatives, family friends, both of his parents — were business owners. When visualizing himself in the future, this is what he saw. Beginning in Jr. High School, Larry had an eye for business opportunities and those early experiences still influence his current endeavors. Larry Bloom tells his story to Bill Moller on Chicago’s WGN Radio. 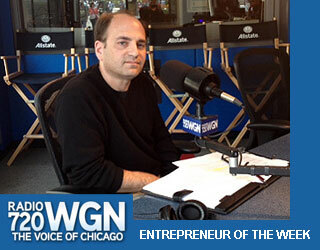 Bloom shared his story with Bill Moller, on WGN Radio 720, back in 2013. Click on the photo to listen to the entire interview. However, Bloom understood that dues must be paid, time-clocks punched and a certain amount of humble pie consumed before one could successfully transition to the role of business owner. Larry Bloom caught two big breaks while working as a manager for a Chicago commercial photo lab. First, when Kodak bought that company and hired him to manage the newly-formed business. Second, when requested by one of the VPs to start a company to provide graphics services to Kodak’s national network of labs. This business became ATI Graphics, Inc. After a year of managing both businesses, Bloom resigned from Kodak to focus solely on ATI Graphics, Inc.
Today, Larry Bloom, President of ATI Creative Consulting (formerly ATI Graphics, Inc.) continues to build his business by developing client relationships and providing superlative service using techniques and knowledge garnered from his education and every work experience, from his first part-time job at Homer’s Ice Cream in Wilmette to the most recent project challenges.